Kawamura-Ganjavian, the Madrid-based company responsible for the original Ostrich Pillow and its recent Junior offshoot, have dreamt up yet another napping device. The Ostrich Pillow Light is made from the same stuff of its showier cousins–“silicon coated micro-beads”–but calls for less of a commitment to sleepiness (and dorkiness) than the full Ostriches. Listening to music can be a drain on your smartphone or iPod battery, and stopping to charge up restricts your mobility. But with the OnBeat solar headphones, you can listen to music and watch videos on your phone or tablet continuously without stopping to recharge. The headphones are wrapped with a flexible solar panel that generates energy whenever you’re out in the sun. The solar panel that wraps around the top of the OnBeat headphones feeds into a rechargeable battery that can be used to charge mobile gadgets. The solar cell has a surface area of 55cm3 with a charge capacity of approximately 0.55W, according to the OnBeat team, but it’s unclear how much energy it can produce. As Tech Crunch points out, because the solar panel is curved, it won’t receive full exposure to the sun at once, which might hurt its energy generating capacity. OnBeat’s founders began creating a prototype for the solar-powered headphones about a year ago, and they have since refined the design. The company recently launched a Kickstarter fundraising campaign with a goal of raising £200,000, which will be used to begin manufacturing the first 2,500 sets of headphones. 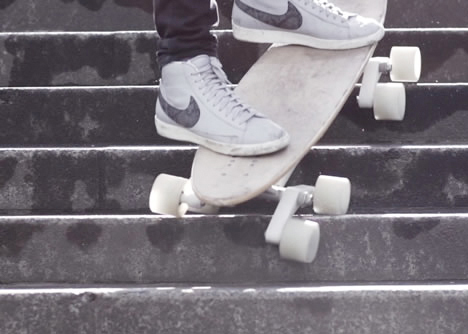 An eight-wheel mechanism allows the unusual Stair-Rover skateboard to descend flights of steps the way conventional skateboards never could. 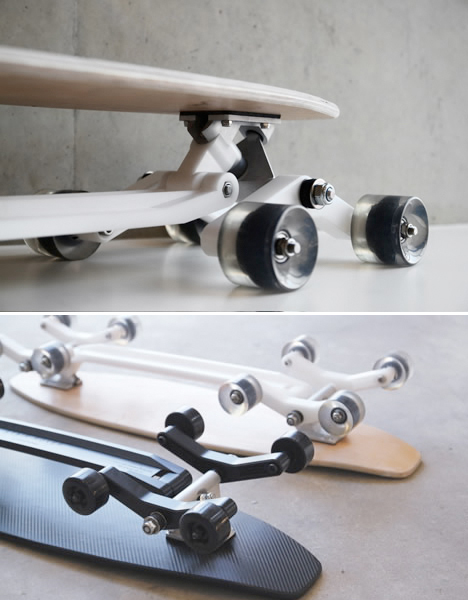 Designed by Po-Chih Lai, the wheel system mounts to a longboard and flexes to follow the contours of stairs and ride up curbs. 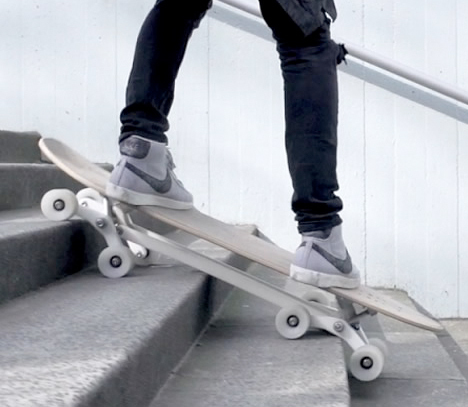 In addition to the original design, which fits wood boards, Lai offers an upgraded Pro version with a fiberglass deck and black components. The chassis goes to work on rough surfaces like cobblestones or uneven paving to reduce impact and prevent falls. Watching GoPro footage makes it clear that there is basically nothing cooler than first-person action sport shots. 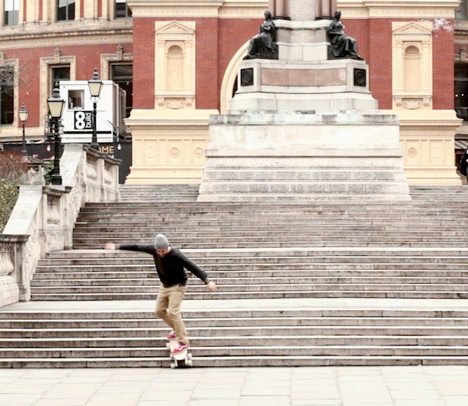 And for those who are spending the day at the skate park, one Kickstarter project is hoping to take that genre of filming to the next level. STABiLGO is a handheld, motorized GoPro stabilizer that keeps the camera level and steady as you turn down a half-pipe or mountain. Creators Michael Boczon and Christine Reilly have raised $33,885 of their $100K goal so far with 12 days left. If you’re wondering how this product didn’t exist already — produced by someone like GoPro or one of its die-hard fans, for instance — don’t ask Boczon. He doesn’t know either. A technical producer and video editor at MTV, he said others had advanced directly to creating aerial rigs and somehow bypassed handheld stabilizers. But Boczon and Reilly have clearly caught a technology wave that others are riding, too. The day after they had been rewinding motors for the STABiLGO, a pre-made motor became available for purchase online. 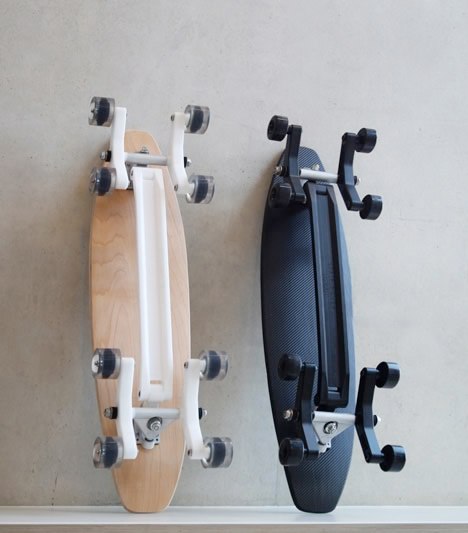 After playing catch-up with the development of the individual components, STABiLGO seems to have broken ahead of the pack. After STABiLGO went up on Kickstarter, six different groups reached out to say that Boczon had beaten them to the punch by only a few weeks. The aim is to move STABiLGO into retail production in China, which Boczon said he intends to do with or without the Kickstarter money. The prototype costs about $450 in parts to produce, and Boczon said they would likely set the retail price between $600-$700.